Llya Repin painted all aspects of Russian life….even when it was dangerous to do so. He lived during the time of Russian revolutions. “In 1917, two revolutions completely changed the fabric of Russia. First, the February Russian Revolution toppled the Russian monarchy and established a Provisional Government. Then in October, a second Russian Revolution placed the Bolsheviks as the leaders of Russia, resulting in the creation of the world’s first communist country”. Llya Repin’s empathy for the common man is shown in his famous painting “Barge Haulers on the Volga”. The Volga Boatmen, who worked as human beasts of burden hauling barges along Russia’s rivers, eventually became folk icons, portrayed in literature, music and painting as heroic symbols of the Russian soul. Beginning shortly before the assassination of Tsar Alexander II in 1881, Repin painted a series of pictures dealing with the theme of the Russian revolutionary movement: Refusal to Confess, Arrest of a Propagandist, The Meeting, and They Did Not Expect Him. 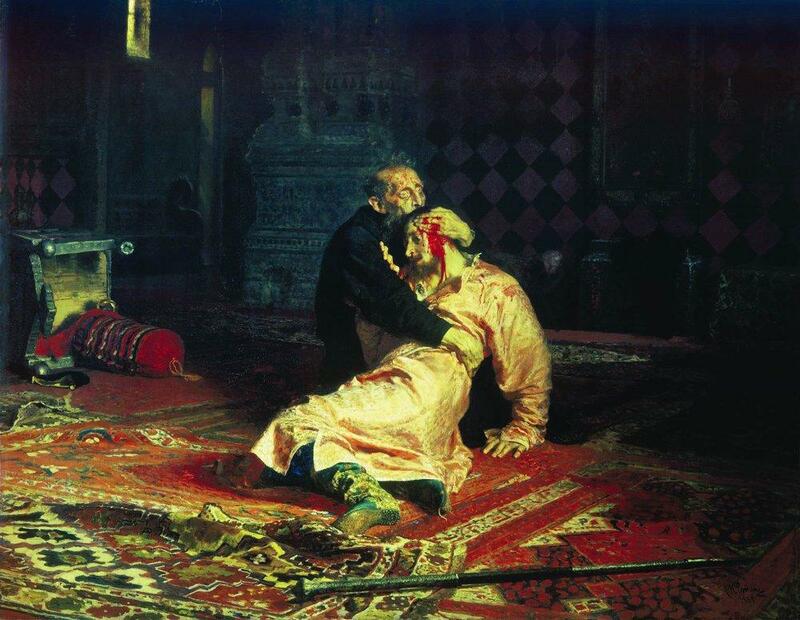 In 1885, Repin completed one of his most psychologically intense paintings,Ivan the Terrible and his Son. This canvas displayed a horrified Ivan embracing his dying son, whom he had just struck and mortally wounded in an uncontrolled fit of rage. The terrified face of Ivan is in marked contrast with that of his calm, almost Christlike son. 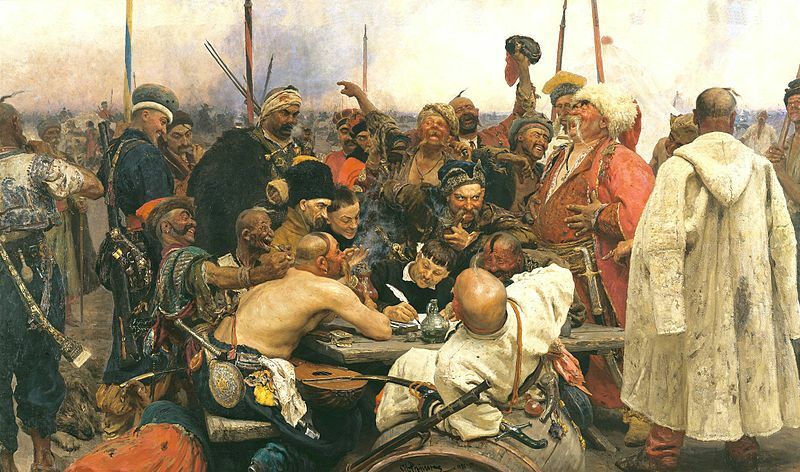 One of Repin’s most complex paintings, Reply of the Zaporozhian Cossacks to Sultan of Ottoman Empire occupied him for more than a decade. He conceived this painting as a study in laughter, but also believed that it involved the ideals of liberty, equality, and fraternity.He wanted to portray Cossack republicanism, in this particular case, Ukrainian Cossack republicanism. Begun in the late 1870s, it was completed in 1891 and was immediately purchased by the Tsar for 35,000 roubles, an enormous amount of money at the time. 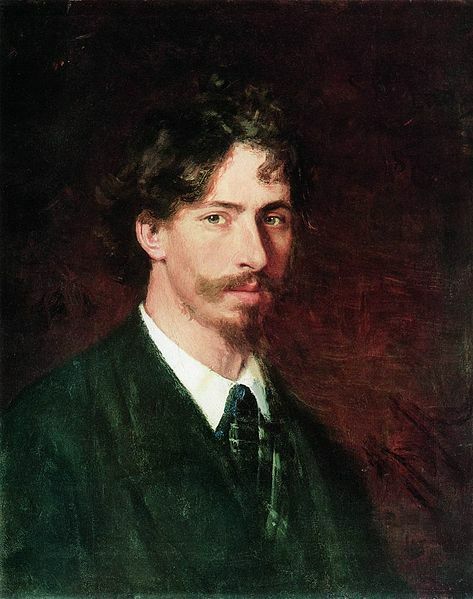 During his older years, Repin painted many of his most celebrated compatriots, including the novelist Leo Tolstoy, the composer Modest Mussorgsky, the cellist Aleksandr Verzhbilovich, the philanthropist Pavel Tretyakov,, and the Ukranian poet and painter, Taras Shevchenko…among others. In 1903, he was commissioned by the Russian government to paint a 400×877 cm canvas, representing a ceremonial session of the State Council of Imperial Russia. Repin designed his home Penaty located just to the north of Saint Petersburg in Kuokkala in Finland. After the 1917 October Revolution, Finland declared independence. He was invited by various Soviet institutions to return to Russia but refused, saying that he was too old to make the journey. In 1930, he died in Finland. After the Continuation War, Finland ceded Kuokkala to the Soviet Union, which renamed it Repino, which is a municpal settlement near St. Petersburg. Penaty is part of the World Heritage Site and is open to the public as a house museum. Videos below: Song of the Volga sung by the Red Army Chorus and Paintings by Llya Repin with Russian heart-pounding music for your weekend pleasure. This entry was posted on October 6, 2013 by Boyer Writes. It was filed under ART, Boyer Writes, For the Soul, Interesting places or People, Music and Art and was tagged with art, Boyer Writes, dramatic music, History, Llya Repin, Russian artist, Russian music, The Volva.